Gameloft previewed a number of titles for us at E3 today. The one that seemed the most exciting for us was Castle of Magic, a 2.5D sidescrolling platformer that simply looks great. 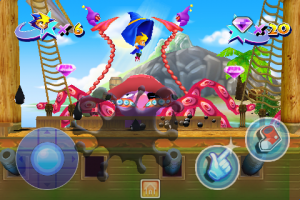 Castle of Magic is an existing mobile game that received solid reviews that Gameloft is bringing to the iPhone at the end of June. You are a little boy that must save his girlfriend from an evil wizard. 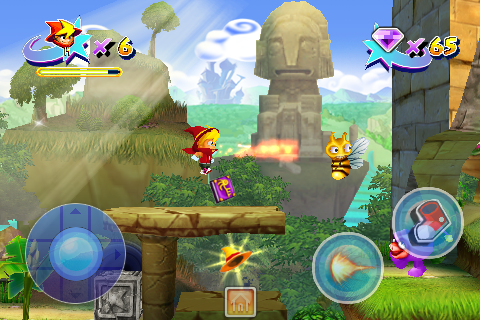 You run andjump your way through levels while mastering level-specific special powers that help you along the way. The game really has that console feel to it with polished animations and intricate level designs. There seem to be a wide variety of level design elements to keep things interesting, as well as a number of secret areas that can be found. 5 beautiful 3D environments, each in a different material influencing the gameplay: slip on ice, swim in the sea, levitate in space, get glued in pastry, and more! Accelerometer use: shake your device to release a superpower. 5 different bosses: the giant snake, the octopus, the space-ship, the snow-man and the bee. + A huge variety of enemies: from pirates to monsters, etc. Transform yourself in 6 different cute characters with each a different power: Robin Hood casting arrows, the invincible fat guy, the reckless swordfish, and more. Lots of secondary collecting quests: find witches hats to win extra lives and search for secret worlds to maximize your diamond collection. Gameloft’s gameplay video shows the quality of the game itself, and we have an actual hands on video that will be coming. 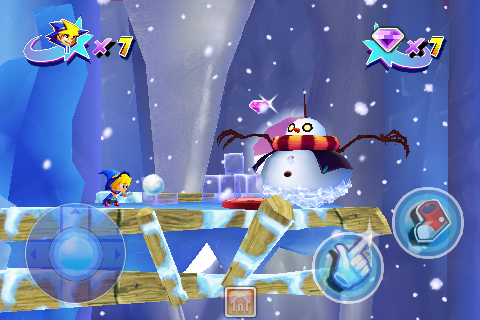 The game is said to include about 3.5 hours of play straight through but each level has a 3-star achievement system based on how many diamonds you collect, and secret areas to help boost your score. Controls use the typical Gameloft control pad on the left with buttons for fire and jump (and double jump). The game should become available at the end of June and is one we are particularly looking forward to. It will be priced at $5.99.